The Branch comprises the areas of East Renfrewshire, Renfrewshire, Inverclyde, East & West Dunbartonshire. At present the branch has a membership of 286, many of whom live outwith the branch area, being spread throughout Scotland, England and as far as France and Spain. Annual dinners are held at Paisley, Greenock and independently at Dumbarton. Although not connected to the branch there is an excellent Police Club at Greenock. Retired officers are always sure of a warm welcome at the Club and membership is open to them. 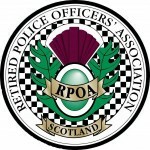 In Renfrewshire an annual dinner is held for police widows. R&D Branch regret to inform you of the death of Harry Craig who died on 4th December 2018. Thereafter 11.15am at Kilbarchan Cemetery.